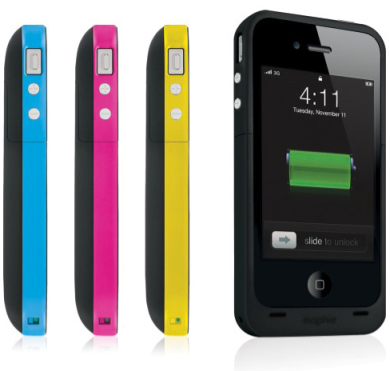 Mophie has come out with a newer version of the Juice Pack battery case for the iPhone 4 called the Juice Pack Plus, which packs a 2,000mAh battery capacity that promises to double your iPhone 4's battery like and some. Don't get too excited though, we've reviewed Case-Mate's Fuel Max battery case for the iPhone 4 which also packs a 2,000mAh battery under it's hood, but in real life usage we only got less than a single full charge. Let's hope the folks at Mophie live up to they're technical claims. The new Juice Pack Plus now has a rubberized band for better shock protection unlike the slimmer Juice Pack Air for the iPhone 4. You can pick this battery case for $99.95 in black right now with more colors to come soon. Hit up the source link for more details.